Fresh Coffee tastes best when it is made using freshly ground beans – exactly the way that the Coffee Press does it! Coffee on demand means no waste and always fresh. Grind and brew straight into the cup in seconds. Or, the optional brewing arm accommodates batch brewing into carafes, satellites and thermal servers for unsurpassed flexibility and value. The Schaerer Coffee Press can replace or enhance your existing coffee program with unrivaled efficiency and the first genuinely new approach to coffee brewing in years. No exotic glass tubes or pour overs for the same old flavor profile here. 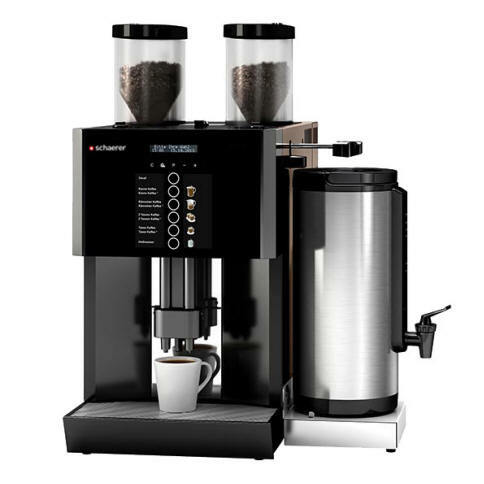 If you’re just starting out, the Schaerer Coffee Press offers a truly unique opportunity to offer something unlike your customers have experienced before. Aromatic, smooth and ground fresh for each serving. It doesn’t get any fresher than that. Dimensions(HxWxD) (in./mm) 27" x 12.75" x 22"